LEGO Dino! Give everyone the LEGO dinosaur toys they'll love. With rugged toy dinosaurs, dino chasers and traps,everyone ones can plan prehistoric adventures in their own backyard. 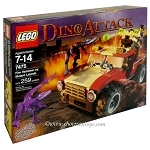 This is a BRAND NEW set of LEGO® Dino Dino Attack 7475 Fire Hammer vs. Mutant Lizards from 2005. This set is still factory sealed and the box is in very good condition with minor shelf wear. 254 pieces and 1 minifigure©.